In 1993, I turned 12. I was in my second year of secondary school and fully in love with Evan Dando. Prince changed his name to something unpronounceable, Myst was released on MAC OS, and Teletext launched on ITV & C4. Aside from all that excitement, 1993 was also the year that Jean Paul Gaultier released his eponymous Classique fragrance… an iconic scent in an even-more-iconic bottle. Roll forward 21-years and Prince is still rocking-out venues worldwide. Teletext, however, has since been banished to the sands of time (who else misses Bamboozle?). It seems the secret of longevity, may be reinvention… Prince knows it and you can be sure that Jean Paul Gaultier knows it too, which is why this Summer marks the launch of Jean Paul Gaultier Classique Intense. Francis Kurkdjian is the nose behind this (re)creation, and with a belief that the original should be more than simply honoured, the perfumer has remained faithful to its precursor with an indisputable air of femininity, overwhelming sense of decadence, and signature sensuality. 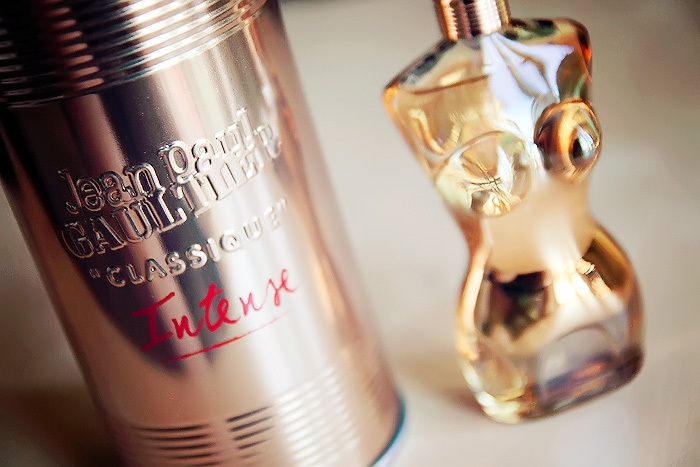 Infact, it is said that the new Jean Paul Gaultier Classique Intense musters 40% completely original composition. The remaining 60% injects the flanker with a little of Kurkdjian’s magic touch. The new Intense version features an opening of tiare and jasmine, inciting a sultry explosion that leads you lustfully into a tender heart of orange blossom and rose. The unmistakable vanilla base is accentuated by the ever-present patchouli that encases the creation in a rich, sweet earthiness that penetrates throughout. In our current heatwave, it’s an overwhelming(ly good) homage to something that might just provoke a steamy night of passion. Far too voluptuous (both the scent and the bottle) to earmark itself as a “summer” fragrance, it’s a distinct v-sign to convention. And let’s be honest, would you expect anything less from either its creator or custodian? the original version of this is my perfume of a lifetime. I never get bored with this!